Learn about how ancient Polynesians used the night sky to navigate as you gaze upon the night sky with this evening stargazing experience. You'll start by attending a presentation on Polynesian history and astronomy before venturing to an observation site. 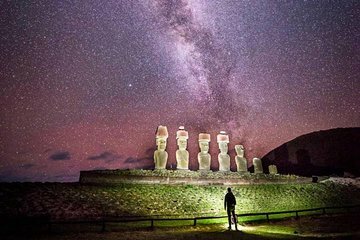 Here you'll get to check out stars and planets through telescopes and with the naked eye before a quick visit to Anakena Beach to do some night photography before returning to your hotel. Please note that if weather changes while out on the tour we will try to take you out again free of charge on another night (subject to availability). No refunds after the tour starts.